In econometrics, the procedure used for forecasting can be quite varied. 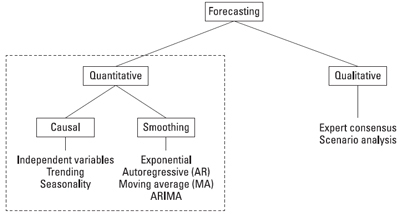 If historical data is available, forecasting typically involves the use of one or more quantitative techniques. If historical data isn’t available, or if it contains significant gaps or is unreliable, then forecasting can actually be qualitative. Quantitative approaches to forecasting in econometrics involve the use of causal and/or smoothing models, whereas qualitative forecasting uses expert consensus and/or scenario analysis. The image shows the traditional classification of nine different forecasting methods. What you see here isn’t exhaustive, but it does include the most commonly used methods. There’s no perfect method for forecasting in a given situation. The best method to choose depends on the information available. However, if more than one method can be applied, forecasters typically use all the methods that are possible and rely on the one with the greatest forecast accuracy. Always evaluate your forecast’s accuracy to determine which forecasting technique is best in your specific application.